Practical Boat Owner: One yachtsman was killed, another lost overboard and three rescued from the 65ft yacht Platino, in extreme conditions off the coast of New Zealand. 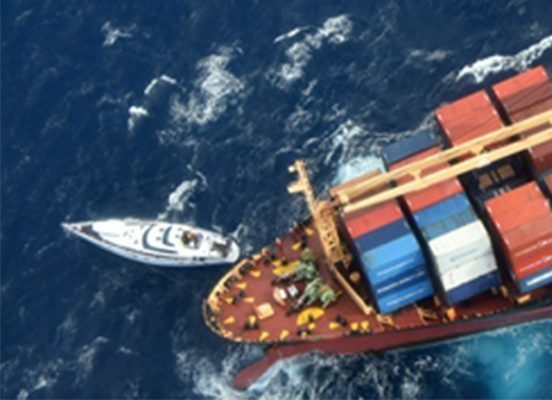 Two men and a woman have been rescued from their battered yacht, Platino, around 550 kilometres north of New Zealand by the crew of the container ship Southern Lily. Yesterday, the Rescue Coordination Centre NZ (RCCNZ) was alerted at 11.20am that one man had been killed and another man knocked overboard from the 20m Platino, which sustained serious rigging damage in winds of up to 75km/h (40 knots). Sea conditions were described as ‘extremely dangerous’ and ‘too hazardous to be on deck’. The search area is out of range to all but fixed wing aircraft. A search by the Royal New Zealand Air Force (RNZAF) got under way yesterday for the missing crewman, aged 63, who is believed to have been swept overboard after being hit by the boom in high winds, which later caused the yacht’s rigging to collapse before midday yesterday. The body of the man who died remained on board – as his fellow crew tried to secure the rigging and the mast that was drifting alongside the yacht. The RCCNZ kept in contact with the three remaining crew overnight via satellite phone. The container ship Southern Lily re-routed and a rescue line was used to help get the trio safely on board around 3pm today. Meanwhile, an RNZAF P3 Orion resumed searching today for the missing sailor. The aircraft subsequently took position above the two vessels later this morning, to provide support and communications during the rescue of the three crew from Platino. The Orion returned to the search for the missing man around 3pm, once the trio were safely on-board the Southern Lily. The body of the man who died remains on board the abandoned yacht, as he could not be safely transferred in the difficult conditions with three metre swells. An EPIRB beacon has been activated on the yacht to aid in tracking its location. It had been hoped that the yacht could be motored back to New Zealand, however conditions on board deteriorated overnight as it lost steering and began taking on water. RCCNZ search and rescue mission coordinator John Dickson praised the master and crew of the Southern Lily for what was a difficult operation: ‘It was not easy to get the three crew members from the yacht to the much larger ship in those sea conditions – they’ve done a tremendous job. ‘We are obviously disappointed that it was not safe to transfer the body of the deceased crew member, but safety must come first. We will keep track of the position of the yacht. The Singapore-flagged Southern Lily was en-route to New Zealand. It is now resuming its voyage to Auckland and is expected to arrive tomorrow afternoon.